Teaching students to work, think, build, grow and develop their knowledge, skills and values to benefit the world around them. leadership opportunities. The welding and machine shop is home to PlasmaCAM technology, various welding techniques, metal fabrication projects and small engine repair. 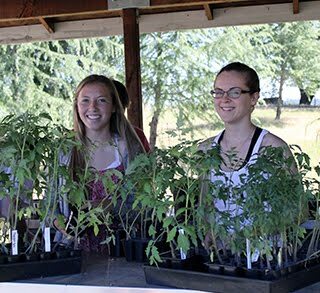 The agriscience program utilizes a unique school farm facility that encourages hands-on learning in both life and physical science as it relates to sustainable agricultural food production practices. The Del Oro FFA chapter, an official chapter of the National FFA Organization, offers a unique leadership program that encourages students to work others in their community and school, develop their public speaking abilities, compete in specialized content areas of agriculture, and complete a hands-on agriculture experience project. FFA Organization, scientific methods, classification systems, principles of ecology, cellular structure & function, as well as the basic principles of genetics & heredity as it pertains to Agriscience. FFA leadership activities, SAE projects and Vocational Agriculture Record Books are a required part of this course offering. This course covers the workings, maintenance and repair of small gas engines. The Briggs and Stratton engine will be the basis of the course with the introduction of other 4 cycle and some 2 cycle air-cooled engines. Changing technology in the small engine industry will be covered. FFA activities will be available to all students. make up, molecular structure and energy processes, as well as in-depth knowledge of DNA structure and evolution, as they pertain to Agriscience. FFA leadership activities, SAE projects and Vocational Agriculture Record Books are a required part of this course offering. Plant & Soil Science is a course for students interested in horticulture, home gardening, plant science or even soil science! This specialized class is full of opportunities to learn the basics of small farm management, including hands on learning using our 1150 sq. foot greenhouse on the school farm facility. We will be learning about the biology of plants and how to propagate, manage and sell them for student profit! We will also be studying the science of soil and the various methods used to manage and irrigate to improve production without waste or harmful chemicals. This course is intended to successfully prepare students who plan on majoring in environmental horticulture or agricultural sciences at a college or university. FFA leadership activities, SAE projects and Vocational Agriculture Record Books are a required part of this course offering. in California. FFA leadership activities, SAE projects and Vocational Agriculture Record Books are a required part of this course offering. This is a basic shop class. Shop safety will be stressed. Tool identification and proper use of these tools will be of primary importance. Arc welding and the use of oxyacetylene for cutting and welding will be stressed. Introduction to M.I.G. and Agriculture Mechanics Core. Welding technology will be stressed. Continuation of beginning welding (gas, arc, M.I.G., plasma arc and T.I.G. ), welding fabrication and construction, materials and fasteners, power tool operation and safety. Students will be required to complete projects constructed in the shop. Students must have a shop project. CAD and other technology will be available to students.